Artichoke is naturally extracted using only the finest quality Cynara scolymus. Our Standardized True Spectrum‰ extract provides active levels of chlorogenic acids, concentrated in the balanced ratio nature intended, without isolating, fractionizing or using toxic solvents, harsh chemicals or gases. Studies show Artichoke can help maintain healthy HDL cholesterol levels. It is popularly used in Europe for supporting normal liver function and aiding digestion. It is perhaps one of the most valuable herbs for overindulgence of food and drink. 1 - 3 capsules daily or as directed by a qualified healthcare professional. Warning: Keep in a cool dry place, out of the reach of children. This product is not intended to diagnose, treat, cure or prevent any disease. 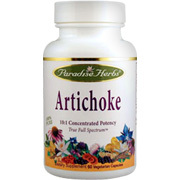 Artichoke is in the Milk Thistle family. Producing large flower heads, the petals and fleshly bottoms are eaten as a vegetable. It is popular for its pleasant bitter taste attributed to phytonutrients found in the green parts of the plant. Artichoke has been well documented and the leaves, rather than the flowers, have been found in higher in medicinal value. The medicinal activity of the leaves are attributed to the presence of chlorogenic and caffeoylquinic acids, including other active constituents cynarin and leutolin. 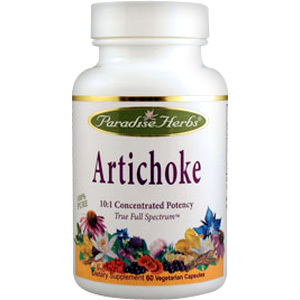 Artichoke leaf extract has demonstrated a beneficial effect on the gallbladder and has been shown to increase the production of bile, detoxify the liver and lower the level of cholesterol in the blood. Artichoke has demonstrated lipid-producing and anticholesterolemic action by decreasing the rate of cholesterol synthesis in the liver and by mobilizing fat stores form the liver and other tissues such as white adipose tissue; triglycerides are also known to be reduced. Other compounds in Artichoke have been shown to help balance blood sugar. It is also known to neutralize acidity in the system and h as diuretic activity and helps flush uric acid from the system. It nourishes the blood and helps relieve arterial pressure. Natural medicine includes its use for all types of liver and gallbladdder disorders, including prevention of gallstones, liver diseases including those related to alcoholism, dyspepsia, chronic albuinuria, anemia, arteriosclerosis, diabetes, high cholesterol, and kidney disease. It is used in Europ as an aid for supporting the digestion of fats and overindulgence of food and drink. Artichoke - is shipped in a discrete, unmarked package. Orders are processed immediately and usually take about 3 to 5 working days to be received. We do ask that you try it for 2 to 3 weeks to feel the full effects. Any information received is used only for order processing and shipping purposes. Your information, such as e-mail address, will never be disclosed to a third party.